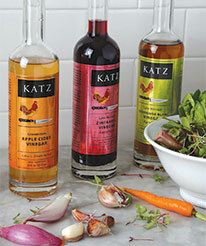 Welcome to KATZ Farm's web-site collection of seasonal salad recipes. All of the following recipes are meant to highlight our product offerings and reflect our many years of experience as both chefs and restaurateurs. As well, it is our intention to provide our customers with fun and inspiring recipes for simple, elegant dishes. All of these recipes are available in a format which can be easily viewed and printed. More recipes will be added each season. . . so please come back and visit us soon!